According to a media report, Facebook and Google have talked about acquisition possibility of micro-blogging service provider Twitter. “Executives at both Facebook and Google, among other companies, have held low-level talks with those at Twitter Inc in recent months to explore the prospect of an acquisition of the messaging service,” The Wall Street Journal reported, citing a person familiar with the matter. The report further explains that the talks have so far gone nowhere, but the prices being discussed value the US-based micro-blogging service provider is about USD 8 to 10 billion. Twitter, which was launched in 2006, started selling ads last spring against its business of allowing users to send messages of 140 characters. It is just one of many web tech targets being hit about as valuation foretold. 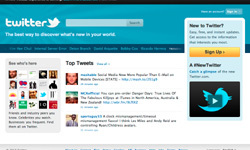 In December, when it got USD 200 million in new venture capital, Twitter was valued about USD 3.7 billion. Twitter’s revenues and valuation have increased even as the company continues to work on ways to translate its more than 200 million registered users into a profitable small business. The company had revenue of USD 45 million in last year, but it total income was decreased as it spent on hiring and data centers and estimates its revenue to be between USD 100 million and USD 110 million this year, according to reports. According to the publication, Twitter spokesperson declined to comment on its finances, valuations and interest by other companies, while Google and Facebook also declined to comment.